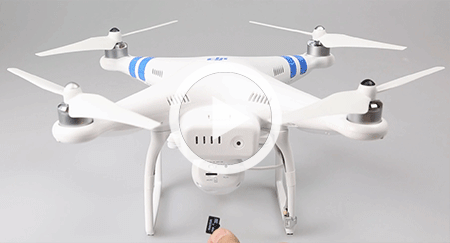 DJI released new firmware v1.1.9 for Phantom 2 Vision's camera FC200! The firmware of Phantom 2 Vision’s camera FC200 has been updated to v1.1.9. Please download it through our website. Thank you for your patience! The latest camera firmware v1.1.9 now supports Adobe DNG RAW format capturing. It also records the GPS location and relative altitude in the metadata of the Adobe DNG RAW file. DJI will keep working hard on improving the quality of the RAW file and providing the best aerial photography solution to our customers. Thank you for your constant support! Follow the below instructions to update your firmware. Download the latest camera firmware and unzip it. Get a clean Micro-SD card (less than or equals to 32GB), and copy the “firmware.bin” file to the root folder of the Micro-SD card. Make sure the camera is turned off, and insert the Micro-SD card into the camera before turning it on. The firmware update will begin automatically. A yellow flashing LED on the camera indicates that the camera is updating. When the yellow flashing disappears, the firmware has been updated. After a successful update, the “firmware.bin” file’s name will change to “firmware.bin.bak00”. This file on the card can now be deleted. During the update, do not turn off the camera or take out the Micro-SD card. This may prevent your camera from switching on and will need a factory reset. A fast red flashing LED on the camera after the update means the update has failed. Please try again. You need to use the latest DJI Vision App (iOS App: v1.0.32; Android App: v1.0.38).